October was a milestone month here at Amavida. 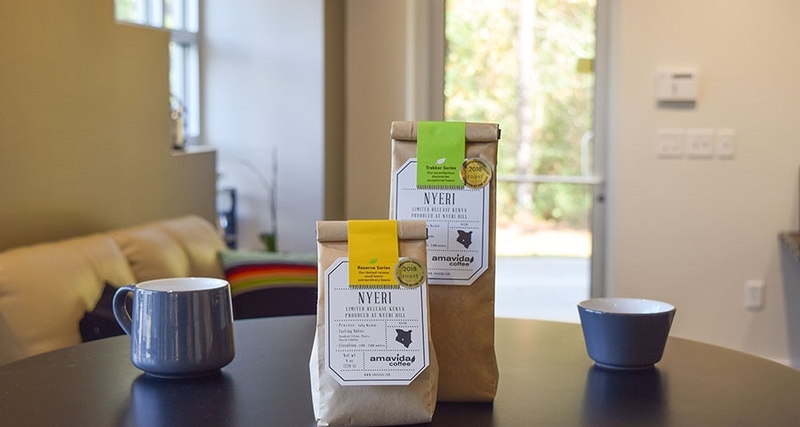 For the first time ever, we received two different Kenyan coffees from the same farm—Nyeri Hill—and they taste very different. Their names are the exact same minus one letter. The packaging is nearly identical. They both are even sourced from the same farm. So what’s different? In Kenya, specialty coffee beans are sorted by size when processed at origin. AA is the largest size, and AB is the second-largest. When it comes to sourcing, the difference in price between AA and AB coffee beans can be large, with the AA beans being more expensive; though the size variation is slight. Here’s the logic: larger beans come from higher altitudes and tend to have more complex flavors and more developed sugars. In the coffee industry, this usually leads people to think that AA beans are objectively better. But that’s not always the most accurate way to think about it—and it’s really obvious why when tasting these two coffees from the same farm. Nyeri Hill AA — This stellar offering features a bright body with notes of candied citrus, pear, and peach cobbler. It’s well suited for the Fall season. Nyeri Hill AB — With sweet notes of nectarine, honeysuckle, and maple syrup, this is a great light and bright offering. Notice: it’s not that the AB has the same flavors as the AA… with a lower quality. The smaller bean size doesn’t equate to a worse flavor in this specialty coffee scenario. The difference is that the coffees offer two different flavor experiences because of the bean. One tastes like an Autumn pastry, the other like a sweet candy. This is the fascinating thing about processing coffee beans at origin. Small changes and attention to detail, like sorting, can have dramatic impacts on flavor. Kenya AA — Can pass through an 18/64” screen but too big for a 16/64” screen. Kenya AB — Can pass through a 16/64” screen but too big for a 15/64” screen. That’s only a 3% difference in size. And yet, big flavor differences. And these beans are from the same farm! This is why these two coffee offerings are so exciting to us. They’re a great opportunity to experience how tiny changes can mean very different flavor profiles and to realize that a coffee’s origin is only one factor that affects the overall taste. It’s fun to taste that, but more importantly, it’s a reminder that coffee beans are a diverse and fascinating world to explore—and we’re thrilled to help you journey into it. Try the Nyeri Hill coffees yourself.